Heather Waibel burst on the cigar scene back in 2006 when, as a grad student, she helped spearhead the campaign in California to turn back a tobacco tax increase referendum. Since then she has moved to Austin, Texas, gotten married (becoming Heather Waibel Haddad), begun her own podcast, started an Internet cigar store, and plans to open a B&M later this year. As president of Fumée, Inc., Haddad, 25, created a cigar operation that isn’t following the usual path. Here, in an email exchange, she offers some insights into what she has accomplished and what’s ahead. SG: You’ve touched on some of the difficulties you encountered in setting up your operation. Did you have any problems getting the requisite licenses and dealing with agencies like the ATF? And as soon as we were back in Austin we were scrambling trying to get one. The state was actually very easy to work with. We’ve had the pleasure of dealing with a knowledgeable agent who walked us through the process, but the problem is that in Texas you need two licenses: one to be a retailer, and one to purchase tobacco from anyone out-of-state. The latter was the one we needed the most at the moment, and that is also one that requires an extensive background check. It took three months to process. Since then it’s been pretty smooth sailing. They ask for a lot of menial paperwork — you have to keep track of everything, down to which shipping company brought the cigars (UPS? FedEx? ), and there’s a strange law that Fumée, distributor, has to sell everything to Fumée, retailer, so there’s some superfluous paperwork, but the state was much easier to work with than say, finding a merchant processor who would run credit cards for an online tobacco shop — that was a doozy. SG: There has been a lot of discussion among cigar smokers about the potential impact of the Supreme Court ruling allowing companies the power to enforce minimum retail prices. Have you experienced that? HWH: We’ve been told by some manufacturers that we can’t sell things under a certain price range, but there’s obviously no real enforcement on this issue. From what I can tell, Internet price slashing is pretty rampant. I’ve actually seen some of the bigger companies sell cigars at what I know to be wholesale prices — their profit margins must be razor-thin. It’s the McDonald’s strategy: sell quantity and make money that way. This is good for consumers, but only in the short term; in the long run I suspect that they will end up spammed to death, and will want good customer service. Of course it’s bad for retailers — both Internet and B&Ms. It’s bad for B&Ms because they can’t compete, and it’s bad for Internet sellers because it’s this practice which has caused some manufactures to cease sales to Internet merchants. I could name you at least a dozen companies that won’t sell to me directly because I don’t have a B&M. They don’t want me to undercut their other retailers! And, for the record, I don’t. I maintain a pretty strict pricing strategy — we’re not the cheapest store on the net, but we make up for it in what I think is the best customer service in the industry, bar none. SG: You are very open on your site about your operation and your plans, especially with your FAQs, videos, and other materials. What prompted you to be so transparent? HWH: I suppose we are. I learned when I saw my podcast numbers going through the roof that entertaining people means that you have a captive audience who also happens to be listening to your message. We are taking a social networking point of view, a viral marketing strategy, which is really necessary for any company today. If we get a new customer who began as a podcast listener, or someone who never smoked a cigar in their life decides to buy one from us as a result of being forwarded one of our YouTube videos, then the effort put into these things has been worth it. It’s also a good point of differentiation for us. I don’t know of any other cigar website that has these little extras, and it’s a way for us to target a new market: younger, newer cigar smokers who learn about companies through things like Facebook or MySpace. I think that being the brand can help in a lot of ways — people root for you, people feel like they know you and not like they’re ordering from an impersonal Internet robot. However, there are downsides. You have to watch what you say because alienating people will translate directly into lost sales. So it’s a double-edged sword. SG: What’s the biggest disappointment you’ve encountered since you began in the cigar business? I try to improve myself every day, set goals, do my best to follow them, but of course I see a lot of room for improvement. That’s what life is, though, a quest to become the best you that you can be. So I’m glad I’ve had this opportunity to reveal certain parts of my personality. I don’t want you to think I’m copping out on this answer, so I’ll give you a cigar industry-related disappointment as well. I have been disappointed with the way that manufacturers try to tightly control their brands by setting price controls, selling to some stores but not others, or forcing you to order certain brands or quantities that you don’t necessarily want. I strongly believe that if someone wants to buy some cigars, sell it to them; if they want to price it a certain way, let them. Let the market correct itself. Controlling things just makes a mess out of it. I think many manufacturers forget that the retailer is their first customer. SG: You’ve obviously decided to make media like the Internet and podcasts an integral part of Fuméeworld. Do you think you have an advantage in that arena, having grown up with those things as opposed to the “typical” cigar shop owner? HWH: I think my advantage is that I can relate to Generation Y because I know how they think, being a member myself. I have the same advantage with female smokers. I am approachable to them, and I know how to market to these groups more effectively. You can’t market to a 20 to 30-year-old the same way you do to retirees. Do I have an advantage specifically with technology, though? No. I know only basic video and audio editing, and I bumble along. So anyone could do what I can. I will say, though, I don’t see why every cigar retailer in the country doesn’t sell online. You grow sales on the same inventory, with very little extra operating costs. Maybe the technology involved seems daunting, but it’s really not as complicated as it sounds. SG: I know you post on at least one cigar forum. How much time do you spend with cigar sites on the Internet, and what do you get out of it? HWH: This is a loaded question. I feel like a cigar board adulterer! Don’t stone me, but I post on 13 cigar boards, two of them German ones, one Australian. It’s been a great marketing tool for us. I notice a distinct difference in sales when I post versus when I don’t. But it’s seriously hard to post on that many boards. It’s time consuming, and after about the fifth one, you have nothing new to say. It’s very draining. Some days I can’t bear to do it. I started off doing it once a day, but it took hours, so now I try to post at least once a week on each board. Cigar Live is the board I started on, though, and I feel sentimental towards it, so I post there several times a week. That’s definitely the one I’m most active on. We also have an area on FuméeWorld.com that we’re slowly building up with a few message boards, and of course we are members of several cigar groups on MySpace/Facebook and Yahoo groups. SG: Finally, you say on your site you smoke anywhere from one to six cigars a week. Do you have a regular rotation or are you always trying new cigars? HWH: I am always trying new cigars. I don’t have a go-to cigar, really. I like variety, there’s so much out there. For me, my smoking habits depend on my mood, the weather, and my social environment. If I’m in Vegas, for example, I’ll smoke like three cigars a day. If I’m around my dad, my consumption also goes up. If it’s nice outside, several a week. But there are some weeks when it’s cold outside and I don’t want to smell bad, and I only get to one cigar that week. I hope to talk my husband into letting me have a smoking room inside the house one day, and then I can smoke no matter what it’s like outside. A girl can dream, can’t she? Many thanks to Heather for taking the time to answer my questions. 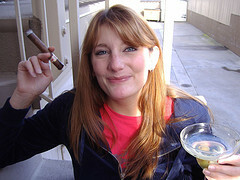 She invites StogieGuys.com readers to visit www.FuméeWorld.com. I think the key to getting that dream is having a three season porch (easily added to the existing house) WITHOUT air vents going to the rest of the house. Crack a window and put a space heater out there and you're set! Patrick A. reminds me of the same dream every day in the Winter…you're not alone!